If Gokarna is the Cow’s Ear, then I am a flea, or a mite or, as always, the Fretful Midge. I travel with trepidation and exhilaration. Before you travel anywhere, no matter how much or how little you know about it beforehand, you have a little picture of how it’s going to be. And it’s never like that little picture which was born of sketchy, squiggly little preconceived notions. I remember I thought of Dharmsala as one great big hill with a temple on top of it where the Dalai Lama sat in meditation, long before I ever got there. None of it could have been further from the truth- except that of course the Dalai Lama does sit in meditation at the top of the McCleod Ganj in his temple, just not all the time. He is surrounded by a town teeming with foundation less houses and hotels that, with one seismic rumble, could all come toppling down. So Gokarna , a small coastal town in the State of Karnataka in India, is the place where Shiva was born in the cow’s ear, which, topographically, is the OM Beach at Gokarna, a piece of coast shaped like a great OM. In my dreamy ill informed mind, I would be visiting Shiva Temples with my son, immersed in the same kind of devotional frenzy that we had at Shirdi Sai Baba’s temple in Shirdi. … but it was not to be. Shiva, a God that would welcome anyone, being the One who meditates in the Charnel Grounds, has temples in Gokarna (and all over India) that are heavily guarded by its priests. The more powerful the deity within, the more heavily guarded. I armed myself with flower offerings pushed on me by a wizened old Gokarna lady- beautiful roses and lilies on a banana leaf- my offering to Shiva. No sooner had we set foot in the dark temple, the priests- bare chested with thick radraksha beads around their necks- told us to get lost. Get out. No welcome. Me, and my son. No. No white people. I handed the priest my banana leaf floral offering, and glared, fleeing the temple in a mixture of shame and rage. At first I felt I had a right to be there as much as any devotee, as I have a great respect for Shiva, the original yogi, who resides at Mount Kailash in Tibet, a place I have been dreaming to go to, forever. All sorts of theories started to whir in my mind: it was a conspiracy of the Shiv Sena, the right wing Hindu Supremacists who can be rather thuggish when it comes to defending their religion. But… it was more than that. It was ancient. That arrogance of the Brahmin priests, it was ancient. The last people they were going to let into their temple, in the very birthplace of Shiva and where the most powerful Shiva Lingam (see above) resides, was and is the white foreign tourist with their silly little devices that they click and snap, causing great irritation to the Gods. The Shiva Lingam (a phallic form that is an abstract representation of Shiva) in this Mahabalewsar Temple in Gokarna is one of the most powerful in all of India. 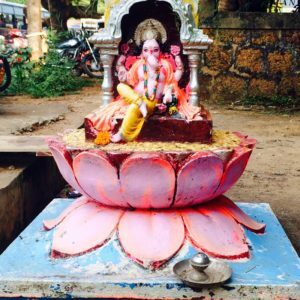 The story of how it got here is long, and involves Ganesha, son of Shiva and Parvati, placing the Lingam on the ground, having tricked the God Ravana. 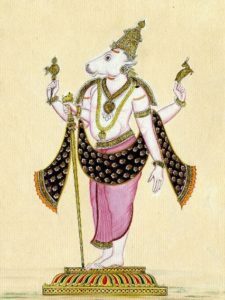 Ganesha vanished from the scene with his cows. Ravana then chased the only cow he could see, which was going underground. He got hold of the cow’s ear, as the rest of cow’s body disappeared underground. It is this ear now seen in a petrified form, which has given the name ‘Gokarna’ to the this town. Gokarna means “Cow’s ear.” (in Sanskrit ‘Gow’ means “cow” and ‘karna’ means “ear”). 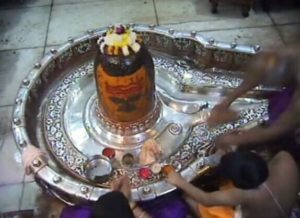 Ravana tried hard to lift the Shiv Linga but failed as it was firmly fixed and he fainted and when he woke he gave the name Mahabaleshwar (meaning all-powerful) to the Lingam. So, Gokarna has a lot to boast about. The next day, outside the Ganesh Temple nearby, (which allows annoying foreign visitors into its sanctum), a motley crew of old Karnataka ladies in bright saris swarmed around us. We didn’t intend to visit Ganesh that day as we had pressing issues with my son’s bowels, so we moved swiftly on… or tried to. But an old lady latched onto me with a garland of lilacs, which she wanted ten rupees for and repeated “das rupee, das rupee, das rupee” so many times, waving the garland in my face, that I gave in and handed her the 10 rupees and took the garland, only to be immediately accosted by a dark brown cow who nudged me with her nose, grabbed the lilac garland and gobbled it all up. Yes, the cows love to eat flowers. We saw a group of them on Gokarna bay on our first day munching their way through a garlanded bus. Meaning that they munched the flowers- threads and all- that decorated the front of this particular bus- marigolds and lilac strung together, heralding the arrival of a bus load of pilgrims. A great feast this was for the cows. So it makes sense that Gokarna is full of cows that munch their way through great vats of rubbish and stinking drains and garlanded buses. It’s quite sad to see, since the cow is sacred, but they do seem very happy. And they do steal flowers, as I have said. So, the cows are part of the street life of India, being great friends with Shiva, the ultimate and original yogi. We were followed by a lot of cows, as much as I was followed in Benares, another very holy city. They nudge you on the street, utterly unperturbed by the honking rickshaws, motorbikes, cars, jeeps and even buses. You see young bulls fighting by the river, and older cows grunting loudly on the street, as if to proclaim they own it. Brown cows, black cows, skinny cows and the very odd fat cow. Even the most impatient, ostentatious four wheelers that honk their way through the tiny narrow streets of `Gokarna, past the open doors and balconies of the priest’s houses, will never push a cow out of their way. Another friend of Shiva’s who we met in Gokarna, is the snake. Naga. Like the Buddha, Shiva had to tame the Nagas, the serpent beings who control the underground waters and inflict illness on those who do not make decent offerings to them. I’m not joking. I’ve seen this practiced all over India. Nagas are not to be messed with. Here at Gokarna we found a tree with several stones around it carved with the ubiquitous serpent images. In many depictions of the Buddha under the Bodhi tree, you’ll see a large snake looming over the Buddha, because he too calmed the Nagas and was fearless of them. 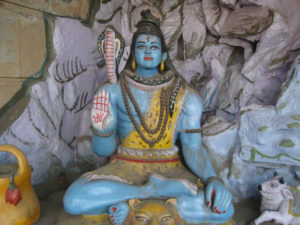 Shiva is ever depicted with the Snake. The Snake around Shiva’s neck is called Vasuki, who was the Serpent’s king. Shiva is absolutely fearless, and therefore has no fear of snakes. The old scriptures declare, “This Brahman is fearless (Abhayam), Immortal (Amritam).” Shiva , who wears serpents as ornaments on His body, is testament to this. 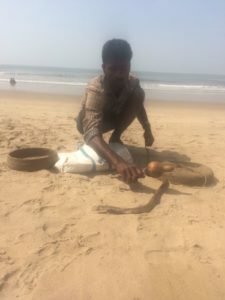 And so, on our first day in Gokarna, after eating Masala Dosas in Prema Restaurant, we walked on the beach and met a snake charmer who kept waving a stick at us. He told us this was was medicine, in case his snake, which he kept in a tin, should bite us. A bitter pill to swallow. He said he would do a dance for us. I said go ahead. He took out his snake and tuned up his funny little bamboo bazouka, and the snake… went Bezerk! Not in any choreographed harmony, but frenetically leaping out of the tin, towards me and zigzagging over to my son, who jumped back on the hot sand. The charmer would pull his snake in again, almost slapping him, and the snake would leap out again… far, far from the neat coiled snakes we have seen in films, rising up in a perfect spiral out of a basket, their forked tongues hissing at the charmer and the viewers. Mister Charmer lost his rag, and stuffed the snake back into the tin, and again offered me the snake medicine for 1,000 rupees. I said no thank you, not now that his snake was back in the tin. We felt very sorry for the poor snake, and gave the Charmer of Snakes 100 rupees. Snakes, grumpy priests, and flower hungry cows, this was our Gokarna. When we went to the Om Beach, shaped just like the ‘Om’ syllable, its beautiiful hot, white sand and blue waters calmed us down. And slowly, over our 11 nights in Gokarna, we began to feel at home. Very at home. We lived at the Haripriya Residency, and felt coddled and cocooned by our hosts, Anu and Anand, who had given us a beautiful, clean blue room with a balcony for our time there. When my son had a fever, Anu made hot milk, honey and jeera for him. And his great fear of being the only ‘white’ was overcome by this generous hospitality. He even picked up his Mala beads in the heat of the day, under the fan, and prayed to Shiva that he would get better. Gokarna has an incredible intensity. Its narrow streets are full of open doored houses where you glimpse the Brahmin priests leaning on the balconies, staring at the pilgrims and the strange foreigners that this place attracts. It was magical, it was both welcoming and unwelcoming, it was another fierce intitiation for my son and his mother, the Fretful Midge, trapped in the Cow’s Ear. Lovely writing Siofra – you’ve conjured for me clear and engaging images of your Gokarna experiences. Great! Such a colourfully & vividly described adventure Siofra. You and your son fearlessly taking on the challenges of a wonderfully different culture. Inspiring. It reminds me a little bit of Dearvla Murphy – taking off around the world on her bike. Your blog has me dying to set off on a travel adventure too!! kWonderful images Siofra and whew very confusing for you and Shereb being so accosted and handled all the time. The spirit shakes . . .
reception at the Gokarna temple.